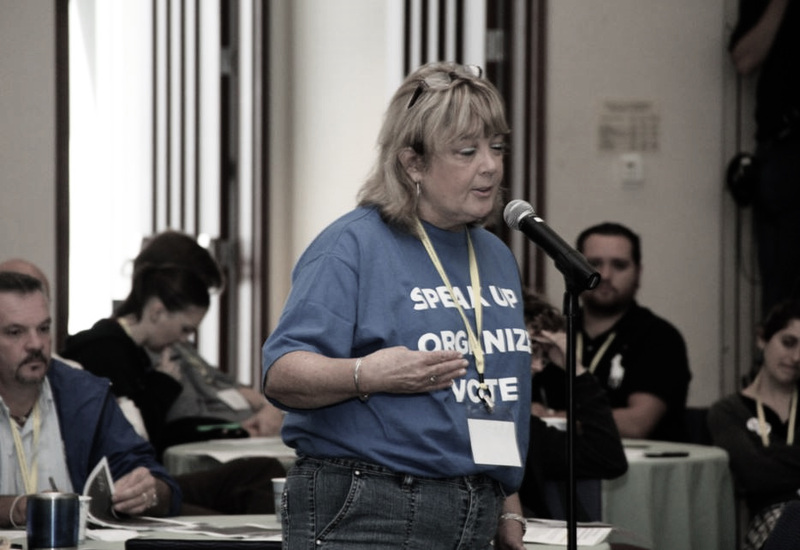 The University of Massachusetts Labor Center has served generations of union activists. Now the administration wants to squeeze it out. Perhaps this is why the Labor Center is now under direct assault by UMass administrators. Labor Center graduate student Chris Brooks spoke with Rebecca Givan, professor in the Department of Labor Studies and Employment Relations at Rutgers University and longtime visiting faculty at the Labor Center, about the importance of labor studies programs to the growth of the labor movement and why such programs have been targeted for assault from the Right. The problems facing working people in the United States are enormous: unionization rates have been plummeting for decades and hourly wages have remained stagnant while productivity has skyrocketed. In short, we are working longer and harder for less. How do labor studies programs train trade unionists to understand our current situation and to work our way out of it? University-based labor studies programs are an essential support to working people. In the early days of these programs, most of the courses were considered “extension” education, and were not for college credit; instead they focused on skills for trade unionists. A few decades ago, there was a realization that degree programs were also important for working people, who might otherwise not have access to higher education. These programs create opportunities for unionists, from rank-and-file members to high-level staff, to learn and study together. They combine practical skills with broader academic knowledge. Students take required courses in areas like labor law and collective bargaining, as well as research and labor history. They learn how to negotiate a contract and how to research a corporation, but also where our labor relations system comes from, and how to approach a strategic campaign; they can take classes on comparative labor movements and on the effects of globalization on North American workers. While some unions offer opportunities to acquire some of these skills, like bargaining and grievance handling, most no longer have the resources to situate these applied skills in the larger political and economic context. When students graduate from the Labor Center, they have both broad and deep knowledge about why we’re in the state we’re in, and what we can do about it. Can you tell us about the history of the Labor Center at UMass Amherst? After World War II, many land-grant universities started labor programs. The initial goal was the same as the goal of the National Labor Relations Act itself — to ensure industrial peace. The idea was that these education programs would allow collective bargaining to flourish, and workers would resolve their concerns through bargaining rather than through strikes. The Labor Center at UMass Amherst was founded a little later than some other programs (such as Rutgers’s, where I teach), following a visit by then AFL-CIO president George Meany to the campus in 1964. It was founded in the tradition of other labor centers at land-grant universities, and was the hub of labor education for the State of Massachusetts. The center has three main programs — a full-time master’s program, a part-time master’s program, and an extension (non-degree) program. Where have Labor Center graduates gone and what kind of impact has their work had? You can’t throw a rock into the North American labor movement without hitting a labor center graduate. They are everywhere — from leadership in the largest unions to key roles in labor-focused NGOs. Several graduates now hold elected office. The Labor Center programs have also awarded degrees to numerous rank-and-file activists, who remain on the shop floor. Current and former students are involved in the Fight for 15 movement, from Los Angeles to Virginia, as well as the day-to-day fight to protect workers on the job. This includes everything from demanding bathroom breaks for poultry workers to representing a worker who has been unfairly disciplined. Can you tell us about the drastic budget cuts that have been made to the Labor Center and the motivation behind them? The budget cuts are very worrying. In cutting assistantships and tuition waivers for the full-time master’s program, and cutting administrative time, the university seems to be straying from its public service mission. Not only has student funding been cut, but administrative time has been cut, and crucial program staff appear to have been sidelined. Right now, the center does not appear to have any administrative support staff, and there is no faculty time allocated to run programs over the summer (an essential time for both teaching and recruitment of students). I will say that I don’t believe the massive construction projects and the athletic programs (with their apparent 80 percent subsidy) are necessarily revenue-generating, so the university clearly chooses to support certain programs regardless of their capacity to generate revenue. What role has the center played in shaping campus life and student activists? To what extent has this made the labor center a target? Numerous leaders in the graduate student union and the faculty union have worked with the Labor Center. From the anti-sweatshop campaigns to the campaign to organize campus resident assistants, there has always been a tight relationship between campus activists and the Labor Center. Graduate students at the Labor Center have frequently taken on leadership roles in the Graduate Employee Organization (UAW Local 2322), an amalgamated local in Western Massachusetts. I would hope that the center is not being victimized because of its role in fostering dissent and activism, but this is an open question. Dr Eve Weinbaum, the former director of the Labor Center who was just recently forced out by the administration, is president of the faculty union (the Massachusetts Society of Professors, MTA-NEA) on campus. The administration’s attacks seem particularly personal towards her. Is there a connection between Dr. Weinbaum’s union activism and the push by management to have her ousted as director of the Labor Center? Professor Weinbaum has been a visionary leader of the center, stewarding the center’s move into the sociology department. Eve is beloved by Labor Center faculty, students, and other stakeholders for good reason: she is a strong leader with a sound moral core and an unfailing willingness to stand up to injustice. Under her leadership the Labor Center has been thriving. The timing of this move to oust her, apparently planned while she was on leave, is suspicious. It sounds like the UMass administration is currently pursuing the same strategy of “death by a thousand cuts” against the Labor Center that has led to the elimination of other labor studies programs around the country. In what way are these attacks at UMass a microcosm for the history of attacks on labor studies programs? Labor Studies programs across the country have been threatened in recent years. At the University of Illinois, only a massive fight saved the program. The Michigan State program is regularly targeted by right-wing think tanks for the work it does. Other former labor programs have morphed into business programs, and no longer provide the educational opportunities they once did. This attack appears of a piece with these other threats. The right wing hates both public education and unions, so labor centers at public universities are an obvious target. These programs are producing graduates who devote their lives to supporting working people and fighting the neoliberal agenda. UMass administrators told Dr Weinbaum that the future of the Labor Studies master’s degree program was in serious jeopardy so long as it was not a “revenue generator” — that is, so long as it does not fund other parts of the university outside the Labor Center. Does this mean that UMass is moving to a business model in which profit is the main metric by which a department, degree, or program is judged? Do you see this approach as being part of the corporatization of higher education? The university’s mission statement speaks specifically to affordability and accessibility, and I don’t see how this is compatible with requiring all programs to be self-supporting. It’s very worrying to learn that of the center’s two degree programs, the one that makes (a modest) surplus was left alone, and the one requiring a (again, modest) subsidy was cut to the point that I believe its survival is threatened. As a professor who believes in the value of a liberal education, I’m troubled by this. If public universities move away from their mission of public service, and instead focus on supporting only the majors with the highest enrollments that lead to the jobs with the highest salaries, we will have lost the purpose of the university. Universities should not be focusing only on revenue generation, or indeed on courses that don’t create critical thinkers. UMass should be proud of the Labor Center; it represents the best of the land-grant vision of universities. Students, alumni, and others have created a campaign to save the Labor Center with a website, Facebook page, and online petition. I would encourage everyone to sign.